Computrols enjoyed a very successful BOMA conference this year. It was the first BOMA conference in which we participated as an exhibitor and presenter. This year also happened to be the most highly attended conference for BOMA International. 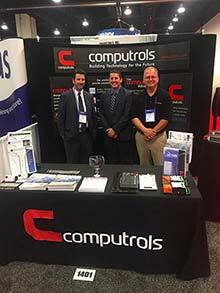 The Computrols team manning our booth included VP of Operations, Drew Mire, D.C. Branch Manager, Bob Hand, Director of Research and Development, Mike Donlon, and Digital Marketing Manager, Scott Holstein. The team met with a number of property managers and facility engineers, educating each of them on the value that a Computrols building automation system could bring their facility. We also had the pleasure of running into a number of our current customers on the exhibit floor. Our team was also fortunate enough to take home the award for the best pre-show marketing campaign. 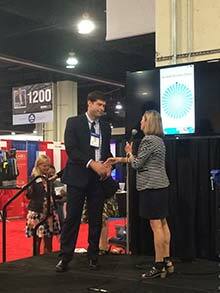 Pictured to the right is Digital Marketing Manager, Scott Holstein receiving the award on Computrols’ behalf at the end of the first day of the trade show. Computrols’ marketing team took a multi-pronged approach in marketing the company’s presence at the conference. The campaign consisted of social media branding and posting, an article dedicated to the exhibitors of the Technology Pavilion, an article dedicated to Mike Donlon’s speaking session, utilization of the BOMA widget on the Computrols website, building out a robust online booth profile, sending out personalized letters to attendees, and following up with some attendees via phone call. 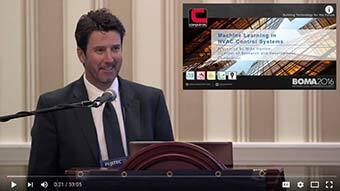 One of the highlights of the conference was surely Mike Donlon’s educational session on Machine Learning in HVAC Controls. Mike took his audience through the basics of machine learning and into the future of its application in HVAC building automation systems. In case you weren’t there, we streamed the session live on Facebook and have put the entire presentation on YouTube to make it more widely available. 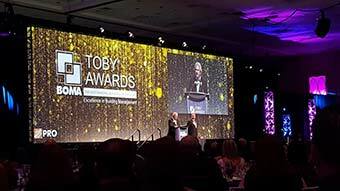 A couple members of the Computrols team even got to attend The Outstanding Building of the Year (TOBY) Awards. The evening honored the nation’s top building managers in 15 different categories, three of which included Computrols customers. Since we found ourselves in D.C. for this conference, we set up a couple of “lunch and learns” for our clients in the area later in the week. Computrols Business Development Manager, Charlie Stiegler presented on cooling tower control based on approach. This presentation built on an already extensive newsletter article covering the same topic. Charlie will soon be recording this presentation in webinar fashion, which we will be sure to share with everyone. This story appears in the July 2016 issue of Automate, the Computrols newsletter.